Questions of ownership have long concerned socialists. 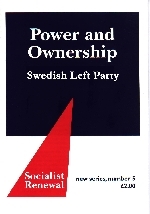 The Swedish Left Party, which receives some 10 per cent of the popular vote in their country, put the question of Power and Ownership at the centre of its contribution to the European Social Forum in Florence. This pamphlet looks at forms of public ownership - national state, regional and local government and non-governmental, workers' and consumers co-operatives - to show how democratic control could be enhanced and inequalities reduced.